The winner of the 2018 Richard Driscoll Memorial Award was announced today (11 October 2018) at the annual Healthcare Quality Improvement Partnership (HQIP) AGM in London. 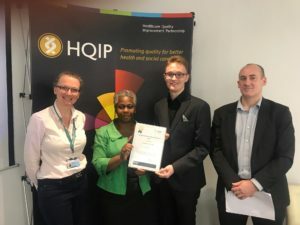 Epilepsy12, one of 40 national clinical audits and patient outcome reviews commissioned by HQIP and funded by NHS England, was formally awarded first place for outstanding patient involvement in clinical audit. Led by the Royal College of Paediatrics and Child Health (RCPCH) and established in 2009, Epilepsy12 measures and aims to improve NHS healthcare services for children and young people with seizures and epilepsy. Between April and June 2018 the RCPCH Children and Young People’s Engagement Team met with over 130 children, young people and families collecting their views on ‘service contact ability’ and family mental health. Over 2335 questionnaires were submitted by children, young people and their carers. Dame Donna Kinnair, Chair of the HQIP Board of Trustees and long-standing CEO of the Royal College of Nursing presented the award to Epilepsy12 project manager Calvin Down and the programme’s youth advocates in front of an audience of healthcare professionals, HQIP Trustees and staff. The inaugural Richard Driscoll Memorial Award, launched by HQIP in September 2018, is a tribute to HQIP’s former Chair of Trustees, a passionate life-long ambassador for patient care, who sadly passed away in 2017.